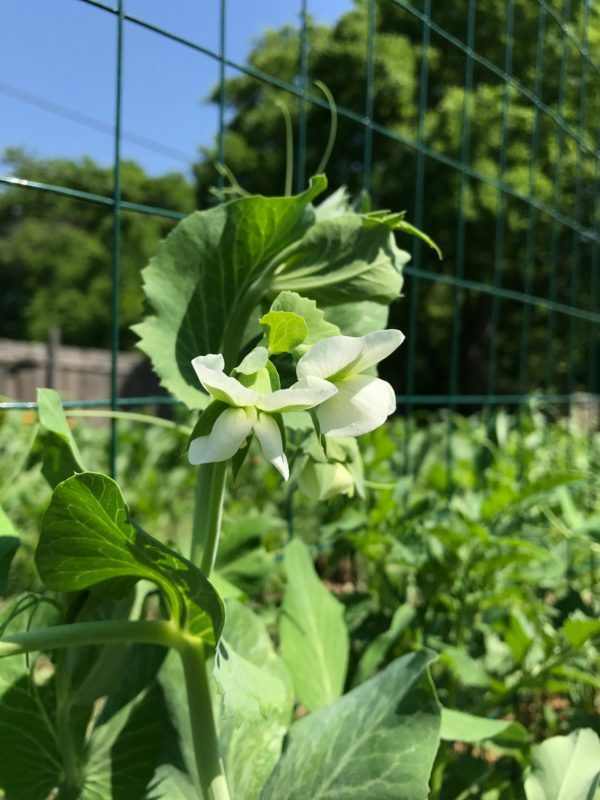 As my husband Daniel and I have been sharing photos of the bounty from our urban garden, I’ve gotten lots of requests for a backyard farm tour. Your wish is my command! One of the biggest selling points of the house we bought two years ago was the giant backyard. 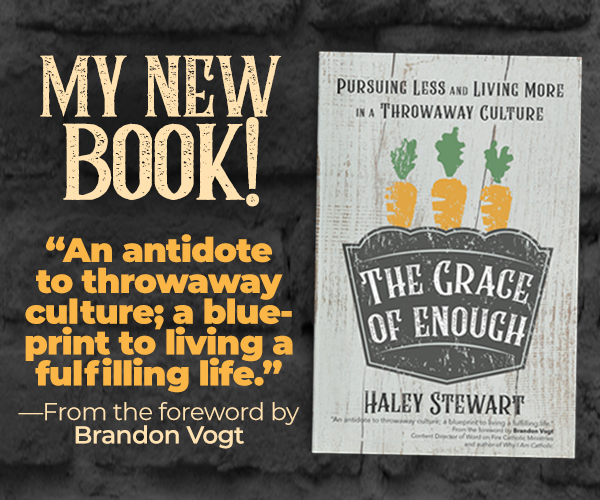 After a great experience doing an agricultural internship for a year on a working farm (yes, that farm where we lived with no flushing toilets), we learned tons of important lessons about how we wanted to live our lives more connected to the earth (and I include a lot of that discernment in my book (affiliate link–>), The Grace of Enough: Pursuing Less and Living More in a Throwaway Culture, released in 2018–and on it’s third printing already! . Our experience also taught us how difficult it is to support a family with small-scale farming. 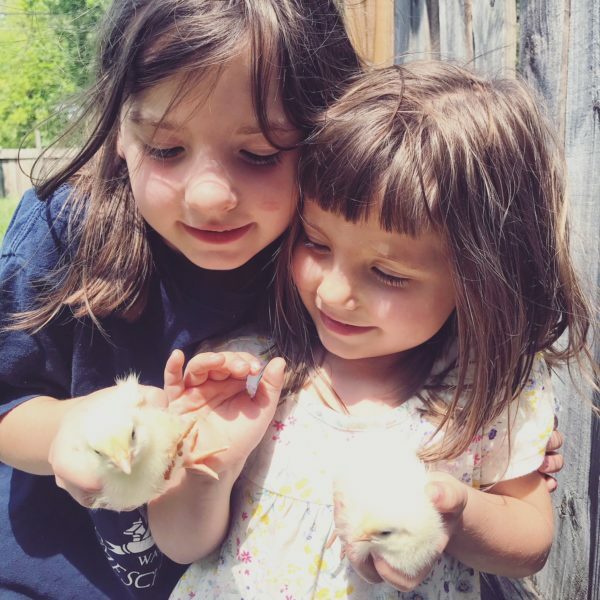 By the end of our farm year, instead of purchasing land out in the country and farming for profit, we started looking for an affordable home in the city where we could make all our urban homesteading dreams come true while living off of Daniel’s steady income as a staff member at the farm (and now working at a local non-profit). The house has a huge backyard that included an extra lot (we think at one time another house was there). 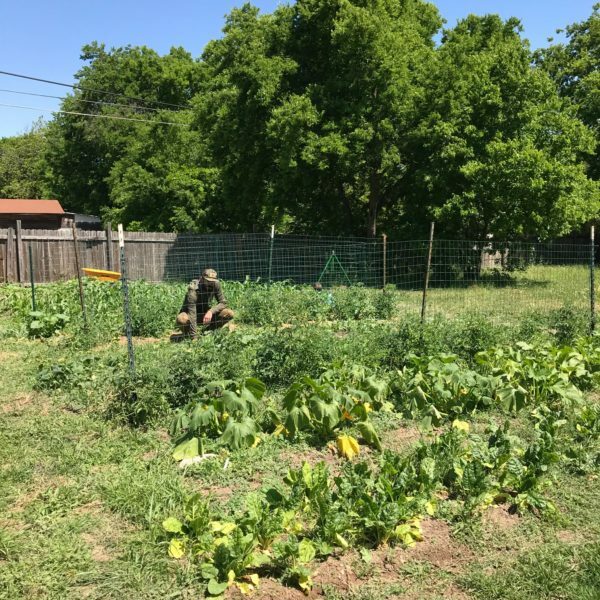 Daniel has slowly been transforming the yard from an expanse of grass into rows of garden beds and a wildflower meadow. 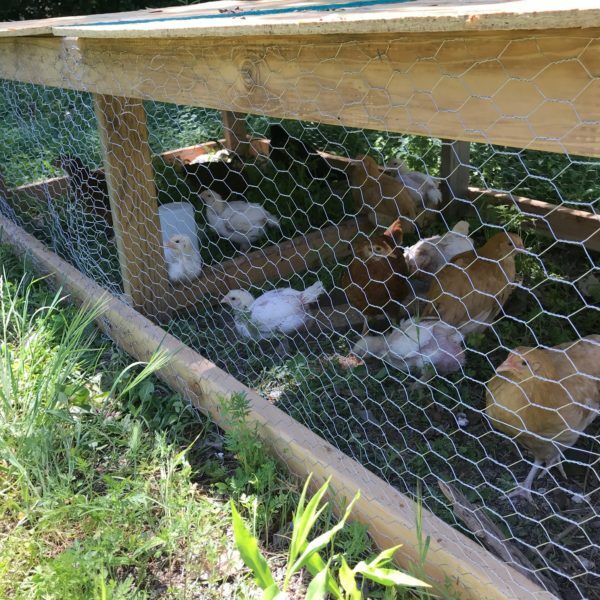 He’s built chicken coops for our layers and broilers and a greenhouse for our seedlings. It’s not Marie Antoinette’s aesthetically perfect play farm. It’s not Joanna Gaines’s farmhouse chic (although if you want that, the Magnolia Silos are just a couple of miles away). 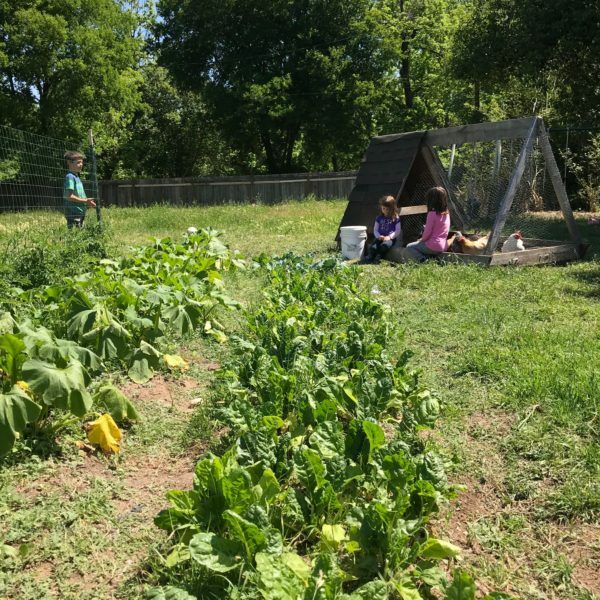 It’s just a messy, lovable space to grow our food and for our children to fall-in-love with the earth and get covered in dirt and wildflowers. 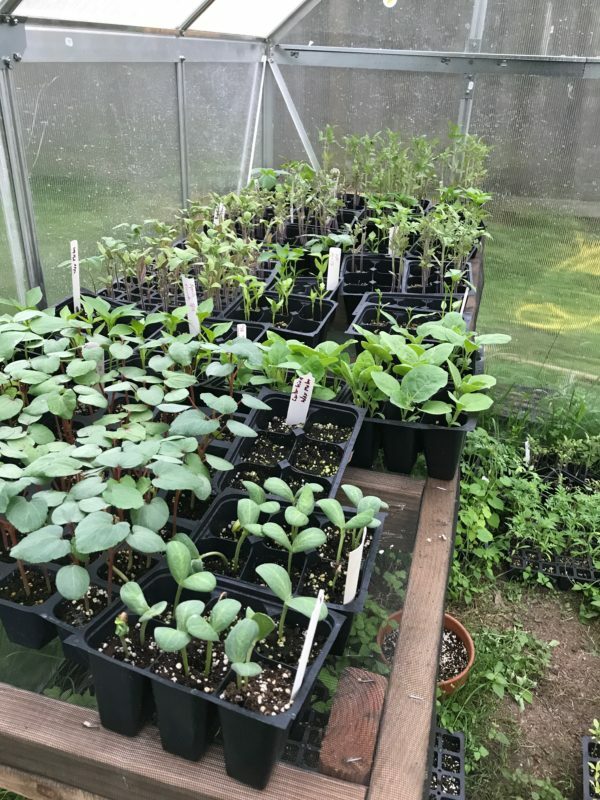 Daniel and the kids spent hours pouring over seed catalogs this winter and choosing what veggies and flowers to plant. And now we’re reaping the benefits! 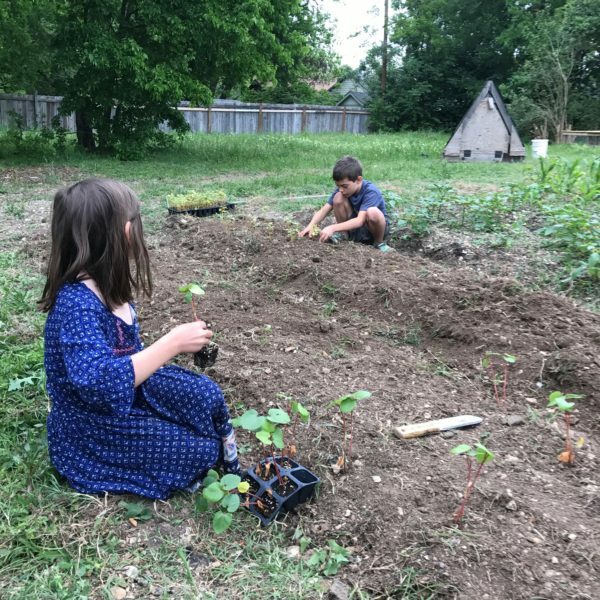 The kids love helping in the garden (and are getting old enough that their weeding attempts are actually useful!). 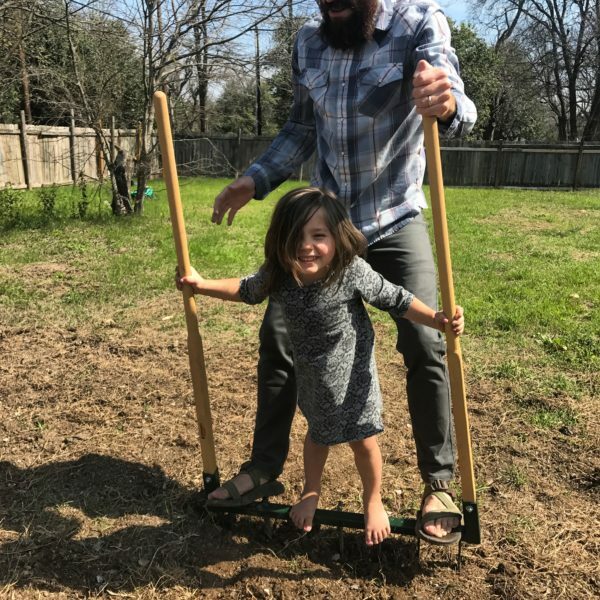 This year a friend brought over a rototiller and Daniel prepared a HUGE garden for all the seedlings to grow in. Then he finished the rows off with a broadfork. 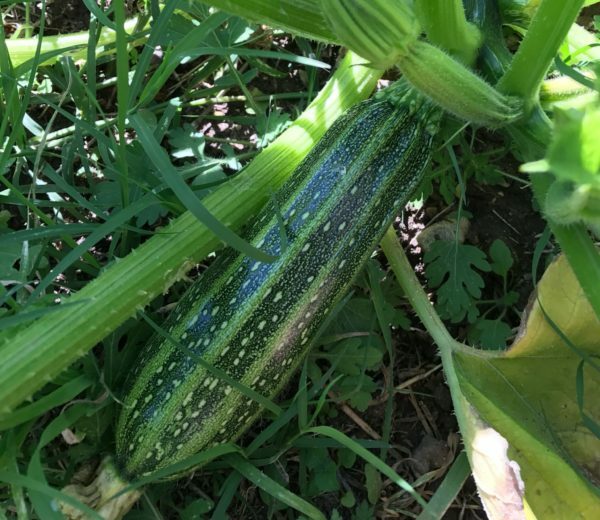 Right now we have zucchini a plenty and the tomatoes are getting ready. This is our dear friend Natalie harvesting some of our Swiss chard for a community dinner. 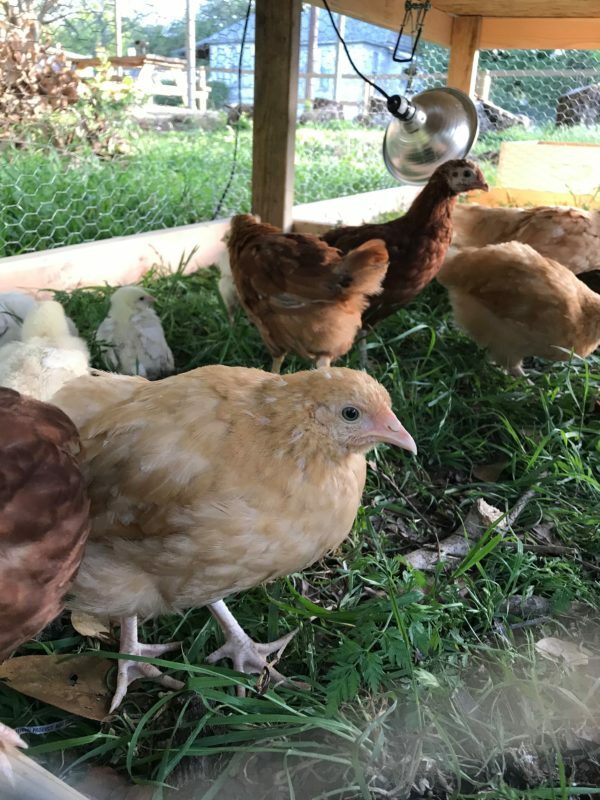 We also added some new chicks to our flock this past month. Our older layers are still going strong in this coop. 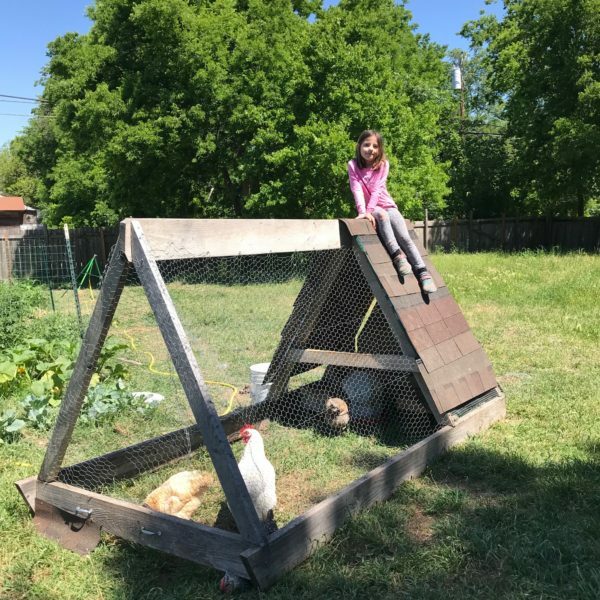 But Daniel and the kids built this new one for the baby layers and the broilers. 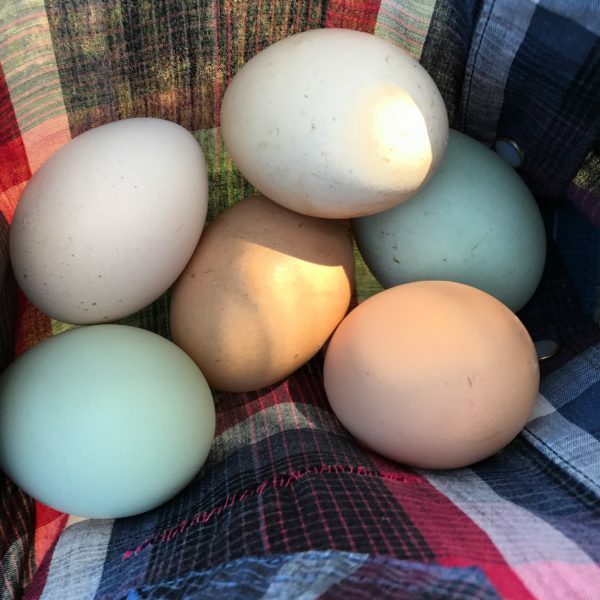 They always look like Easter eggs to me. 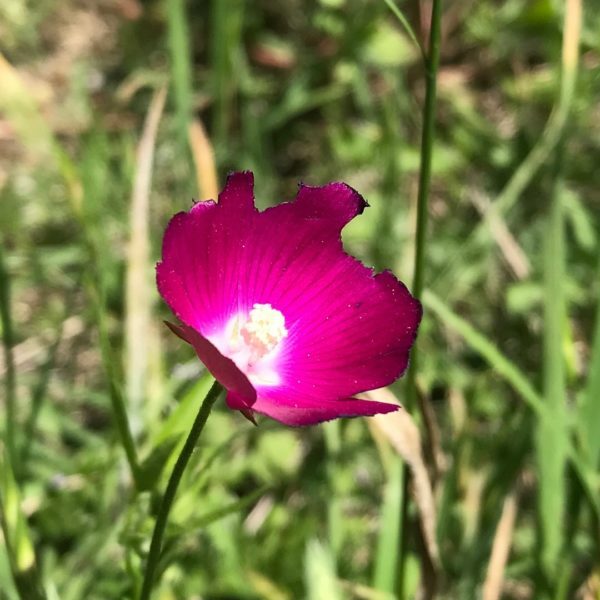 And to avoid so much mowing and for a little extra beauty, Daniel planted wildflowers in one quarter of the yard. And the girls love these little wine cups. 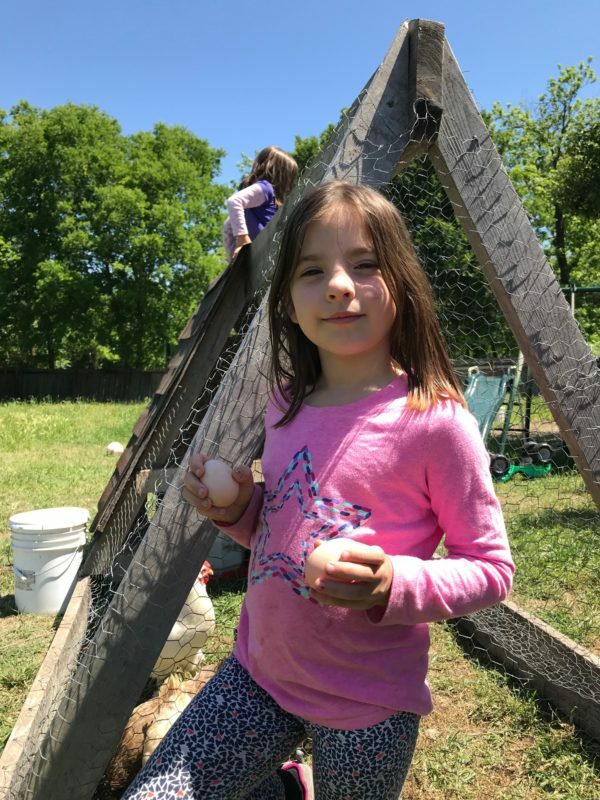 The best thing about having so much going on the backyard is how much our kids love to spend time out there in the sunshine. Daniel keeps his bee hives elsewhere, not because honey bees are naturally aggressive, but just because small children might upset a hive unintentionally and I don’t want to have to worry about a bee sting tragedy! 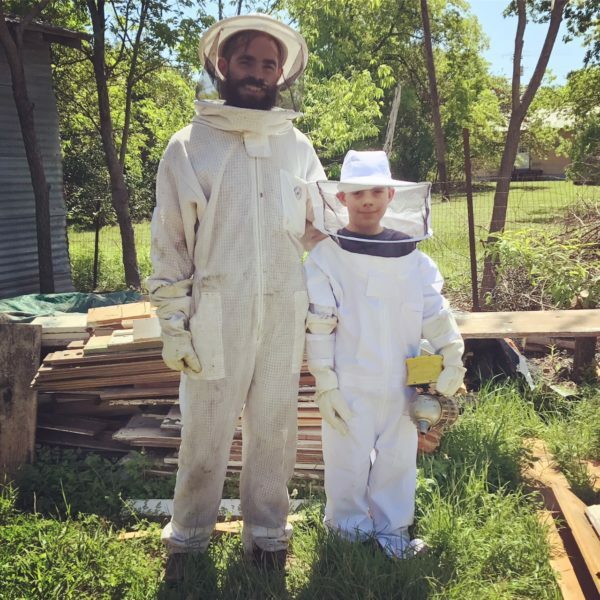 But Benjamin got a bee suit for his birthday this year and has been going all around with Daniel to work with hives. He feels so grown up! 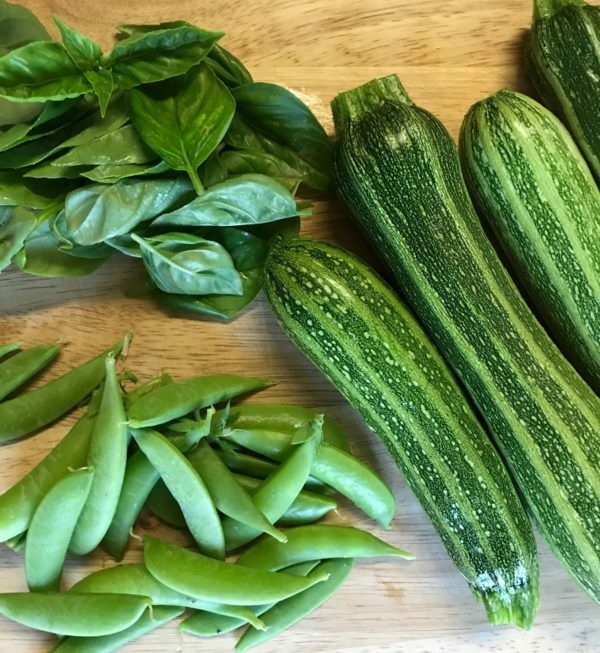 And I for one love going out my door to harvest goodies from the garden to make dinner from things that were connected to the earth just a few minutes prior. 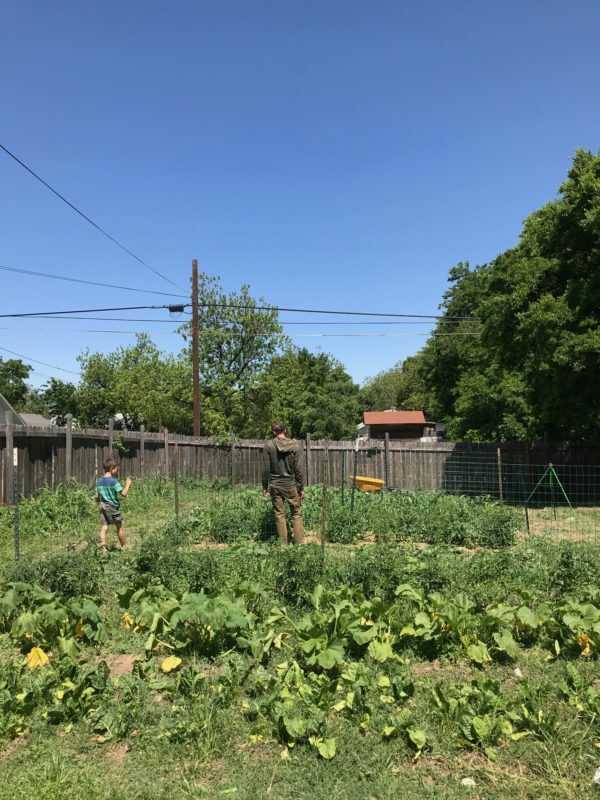 So that’s our little backyard homestead. I really can’t take any credit for it because it’s really all due to Daniel’s hard work and expertise. If you have questions, I’ll probably have him jump into the comments because I might not be able to answer everything. Most of the work he’s done since we got on a new, unusual work/life schedule for our weird homeschooling family. That is just remarkable, Haley! Your backyard garden is what I had hoped to have. But I am content with my 4 small raised beds which are currently keeping me supplied with Swiss Chard and beets! God Bless you and your family. You are all delightful folks! Yes! Please do, Alexandra! It’s been too long since we had a Stewart Foley shindig. I hope I don’t seem creepy, Haley, but I read very few blogs posts and yours are among the most frequent. I don’t know how I found your blog to begin with, but I was so excited because I know these people! I lived in the area until a few years ago, back when I was a Freeman, but now I’m a Gamez and live in the show-me state. Now I’ll have to follow your blog now that I have a personal connection :). We badly want to do all these things as well in our yard, but it’s teeeeny tiny. Starting to growing what we can since we are happy to have a yard at all. We hope to have some more acreage later. Land is so much more affordable up here! Are layers amd boilers two different breeds of chicken, or does that just indicate your main intention for them? Indicates intention, Erin! The layers are the egg-producers that we’ll keep around for a long time. The broilers or “fryers” are meat birds. 🙂 And thank you! Might be a weird question, but how do you water it all? I’ve thought about rain barrels? Any experience with those? Are they worth it? 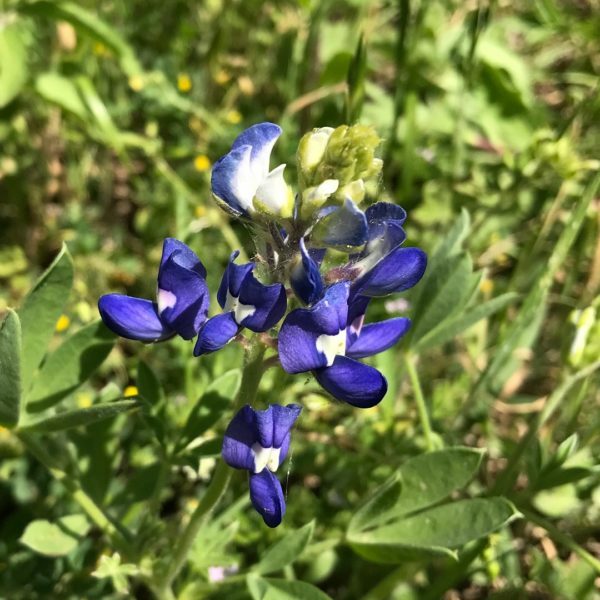 How do keep your beautiful plants alive and watered through the Texas summer? 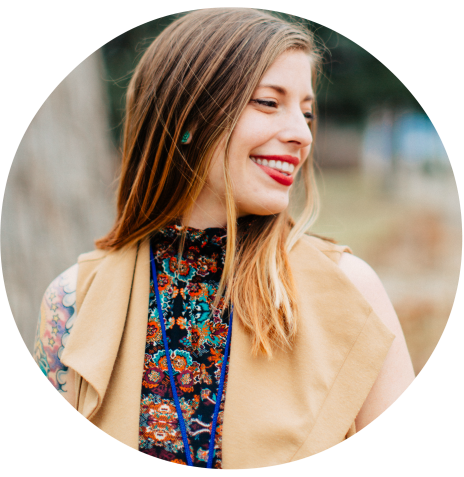 Hi Whitney, I’m not Haley but I am originally from Michigan (currently living in Minnesota) and do know a few things about rain barrels and gardening. The short version is rain barrels are really helpful to install to help prevent local problems like street flooding when rainfalls get heavy, but I wouldn’t use the water in them to irrigate plants you intend to eat. The water can pick up chemicals from your roof shingles/gutters as well as bacteria from sources like bird poop. There are recommendations to follow to reduce risks if you want to go for it (keep your rain barrel clean, don’t collect the runoff from your roof for the first half inch of rainfall because it’s the dirtiest, water the soil not the leaves, etc.) but we have two rain barrels and we don’t use them on our veggies. However, it’s totally fine to use water from your rain barrel on trees, shrubs, and flowers. 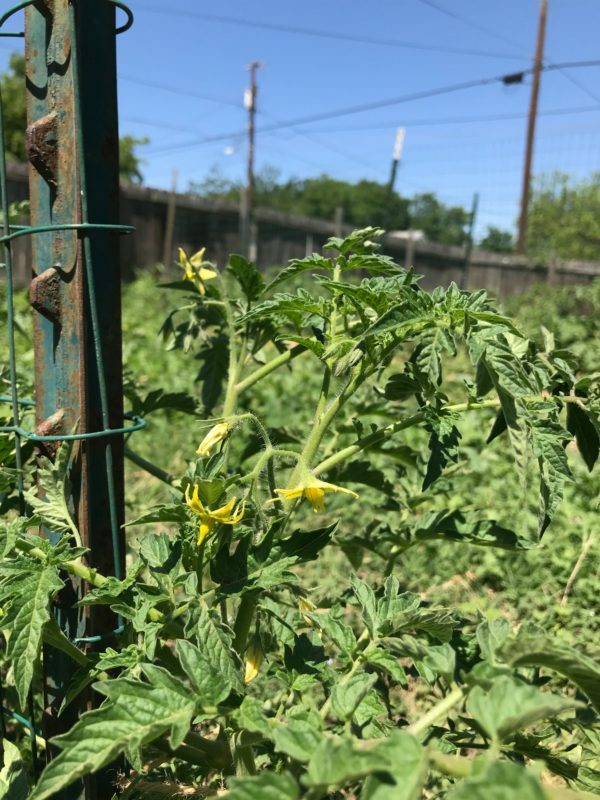 My number one recommendation for people looking to cut down on watering costs of veggies is a soaker hose; it waters the soil instead of the leaves and it’s a great way to put water where you need it and not where you don’t. Plus it can also help cut down on mildew and things because you’re not getting the leaves wet, only the soil. 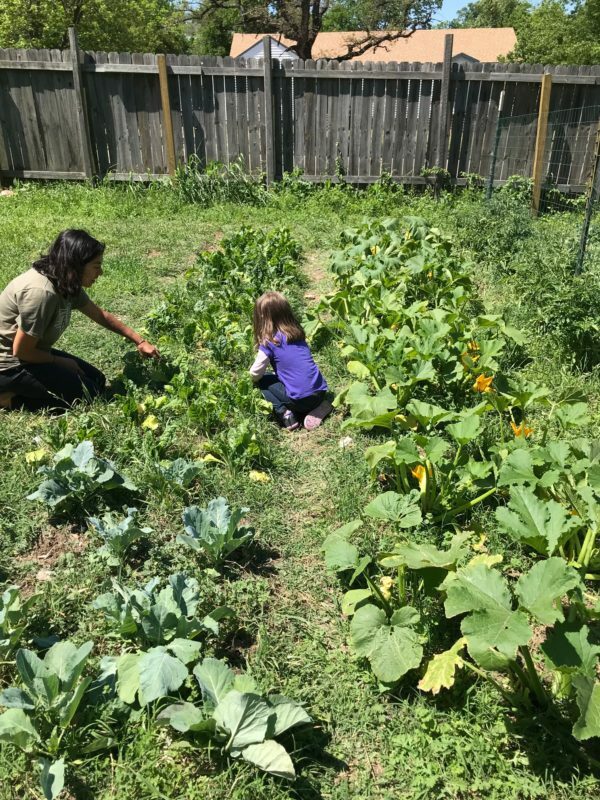 We also do water re-use from the water table and inflatable pool we set up for our toddlers; when they are done playing all that water goes straight on the vegetables (assuming there were no ahem, “accidents” in the pool!) Happy gardening! I love it! 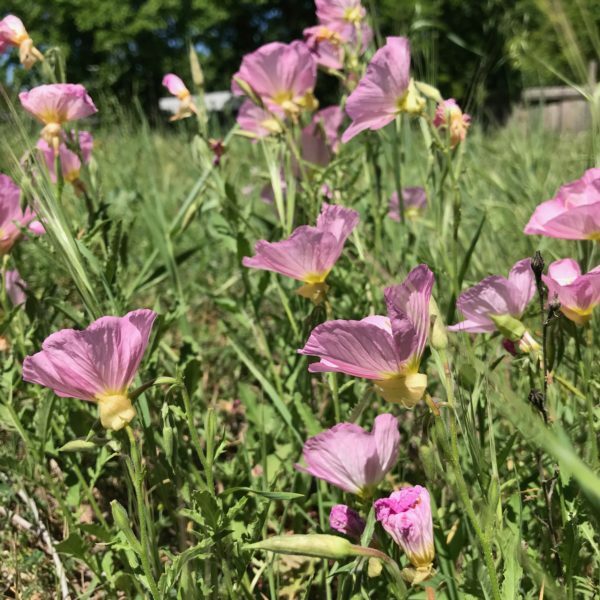 Especially the wild flowers – as I’m sure there birds and bees enjoy them! We are on our way to following in your footsteps! Such an amazing space! We have a hard time keeping up with the weeds in our (much, much smaller) garden. How do you stay on top of it?!?! 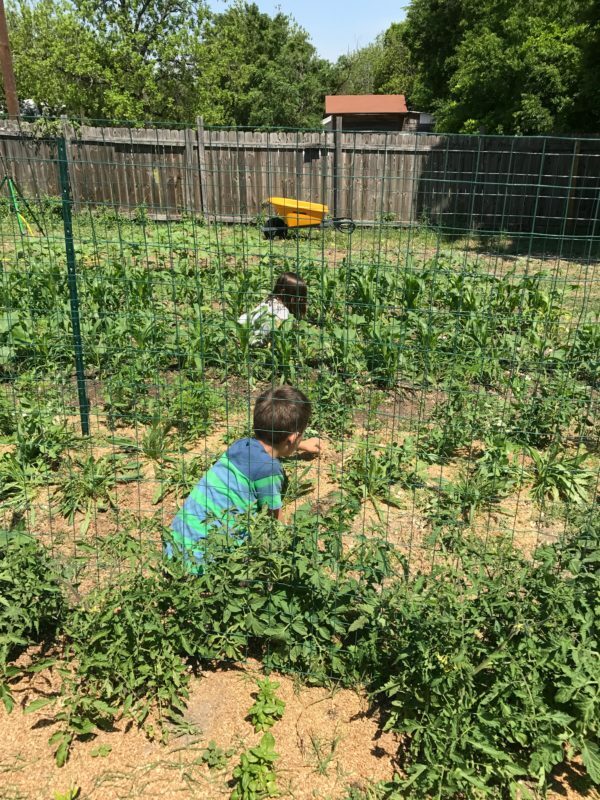 Daniel and the kids do all the weeding! With all the sunshine we’re getting now it’s starting to be quite a job. Oh my goodness! I LOVE it! This is so beautiful and inspiring — thank you!! This is great! We’re just getting our cold weather crops in the ground (Kale, Swiss Chard, lettuce, peas) here in Northeast Pennsylvania. 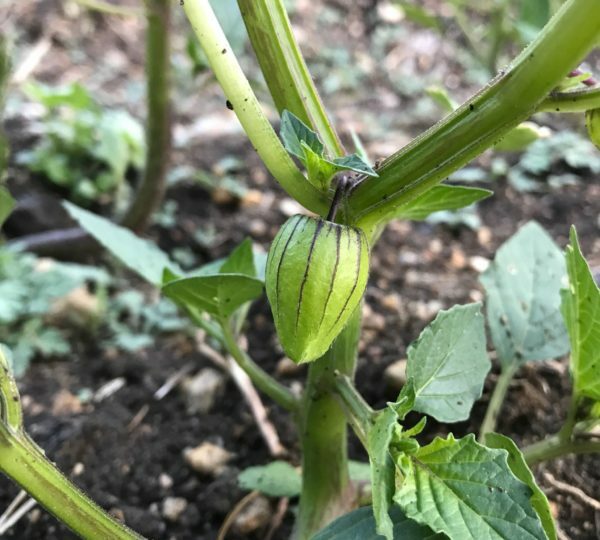 I long for your growing season…but maybe not the crazy hot summers. Thank you for the tour. 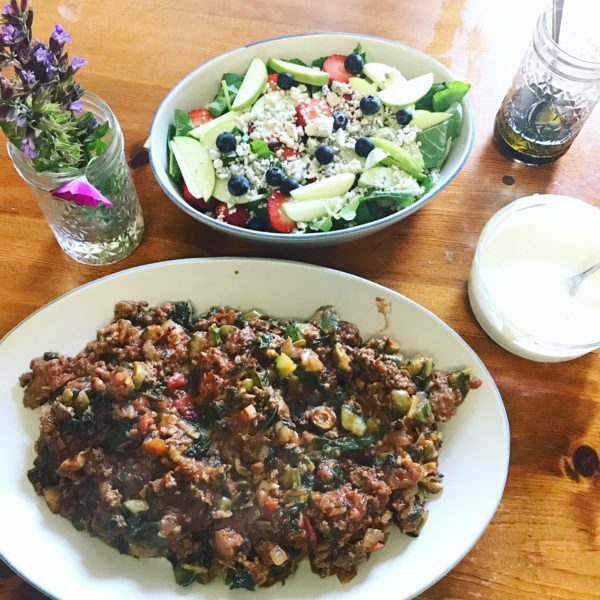 How do y’all control pests and bugs that would eat your veggies and fruit? This is my main issue with gardens I’ve had in the past because I don’t want to use any chemicals or pesticides. This post just fills my heart with joy. Thank you for sharing! Your family and backyard are just lovely. God bless you! This is so beautiful and inspirational! Your kids look so happy! I’d love for this to be a part of my daughter’s childhood. This is incredible! 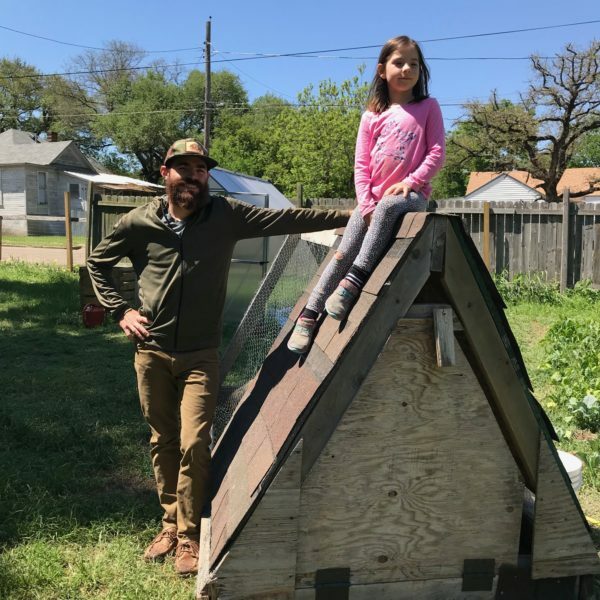 I dream of having a homestead, urban or otherwise… And I realize that to get there would require not only the land but a whole lotta knowledge and skill I don’t yet posses. But life is long (hopefully!) and I can learn new things! For now, I’m just happy that we are starting some seedlings for two large, raised beds and we have a compost heap. 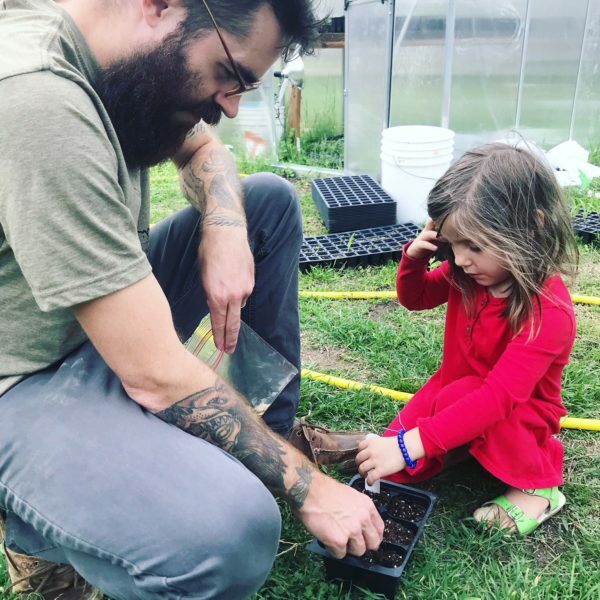 I also try to have a homestead, “pioneer” mindset, DIYing what I can and so forth. I’m no expert on that either; I mostly go to other people’s blogs for that! But thanks for sharing your little piece of heaven on earth. It is truly inspiring! Well in full disclosure, Daniel does all the real work and research. But from watching him, lol, I think he just tries things out til he figures out what’s working! Sounds like you’re off to a great start with the raised beds and compost heap! YES! Thanks for sharing Haley! 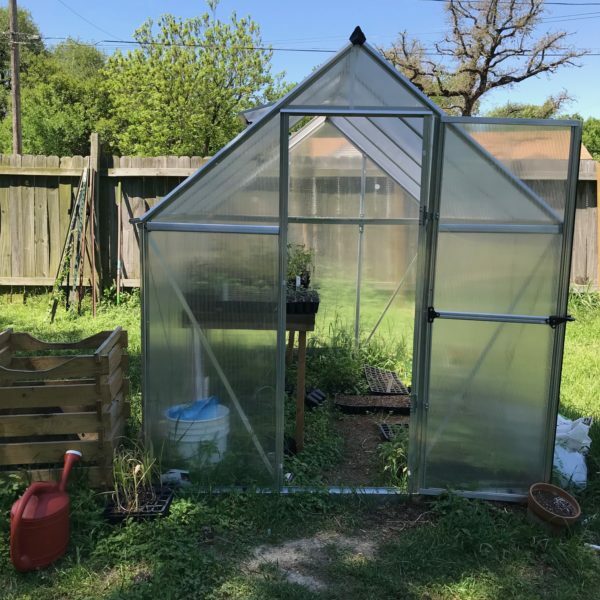 Loving the greenhouse—we put up cold frames this year as part of our kids summer homeschooling projects. I planted the seeds we got from Johnny’s. My husband’s remark was, “Looking like low germination rate.” Haha! Our yard is similar looking only throw in lots of saw dust for all the hive bodies my husband has been busy building/selling. Thank you for the tour! Your garden is beautiful. We live in Michigan (aka the land of the gray 6-month winter), so our home suburban garden won’t be ready to harvest until late summer. Seeing your photos is great inspiration. Would you mind telling me how big your lot is? 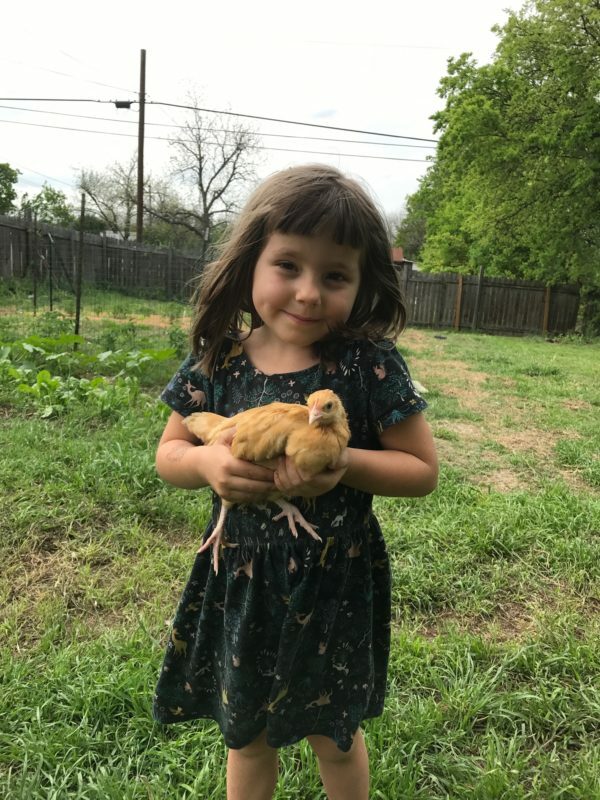 We’re starting to look for a place where we can do ALL THE HOMESTEADING THINGS, but would be content with space for our chickens, garden, and bees especially if it means walking to Mass! So I was just wondering how much yard you are doing all this on? Hi Katie! It’s 3/10 of an acre. Somehow the house is connected to an almost triple lot. We think back in the day there must have been two houses.